EA is hoping to get 2 million subscribers for Star Wars: The Old Republic in order to justify the expenses, says an analyst - but the game might just be able to pull it off. Between Dragon Age: Origins and Mass Effect 2, Edmonton-based BioWare is quickly proving itself to be the crown jewel in the entirety of the EA Empire - which may be why the publisher is risking so very much on the upcoming: Star Wars: The Old Republic. EA has been injecting SWTOR with millions and millions of dollars, and has outright called the game the "largest ever development project, period, in the history of the company." So naturally, expectations are high as well. According to IndustryGamers, Sterne Agee analyst Arvind Bhatia met with EA and reported that the high cost of developing the game has significantly lowered earnings at the videogame giant. But the massive expense could be worth it, says Bhatia, because the publisher is hoping for - and expecting - to see subscription numbers above the 2 million mark. While 1 million subscribers would likely be enough to break even, added Bhatia, EA is hoping for 2 million - probably in order to be able to recoup its expenses more quickly and start turning debt into profit. 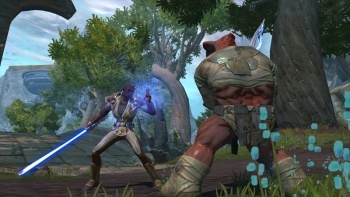 If SWTOR does hit the 2-million mark, it would be only the second pay-to-play Western MMOG to do so - the first, of course, being WoW. In 2008, both Age of Conan and Warhammer Online briefly hit 1 million subscribers out of the gate, but these numbers quickly fell. Can SweaTer (eh, it's no "MewTwo") pull it off?